There is no mistaking the smartness of Messrs Pathé, and their latest achievement — the production of a weekly cinematograph paper, The Animated Gazette — has just about beaten all records for the interest which it has awakened among the great B.P. [British Public]. The daily Press has been devoting considerable space to it, with the result that curiosity has been aroused, and people are now busily discussing the latest thing in moving pictures. Briefly the idea is to incorporate the usual journalistic methods of writing into filming, and to portray, in lengths of about 80 odd feet, the chief items of interest that have happened during the week. Thus the illustrated newspaper is being superseded by The Animated Gazette, which depicts the actual scenes of contemporary history in living and moving reality. Mr Valentia Steer, a well-known journalist, is editor of this moving picture periodical, and he has a staff of photo-correspondents, who are stationed in all the big cities of Europe, besides another staff at home. Last week’s news consisted of pictures of the cross-channel flight, Oxford University Eights’ trial, Peary at Edinburgh, Roosevelt at Cambridge, besides many interesting ‘glimpses’ from home and abroad. This week’s contents bill announces motor-racing at Brooklands, the manouevres at Salisbury Plain, the departure of the Terra Nova, Chinese mission in Paris, quarrymen’s strike, Caruso in the street, Modes in Paris, and other ‘newsy’ films. That the idea will catch on is undoubted, and it is perhaps not looking too far into the future to anticipate the time when the weekly Animated Gazette will become an indispensable ‘daily’. 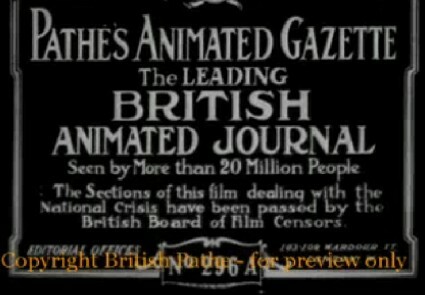 This piece announced the arrival of the British newsreel, in the form of Pathé’s Animated Gazette, edition no. 1 of which appeared at some point in the first week of June 1910. It wasn’t the first newsreel in the world – that honour generally goes to Pathé Fait-Divers (later Pathé Journal), launched in France in 1908. There has been film of news events ever since films had been invented, but they weren’t newsreels. Newsreels meant regularity of service, and that was dependent on a network of cinemas and an audience which could be guaranteed to come back to the cinema week after week. 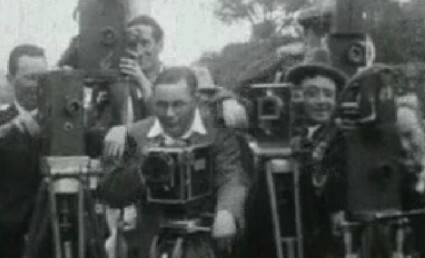 Before cinemas started to appear – the first ten years or so of film history – a film might be made of a news event, but it seldom could be presented as news, that is while the event was still current and with the report being understood as being part of a regular, always updated filmed news service. Cinemas supplied the loyal audience, and it is the audience that makes the news, because what is news to one person isn’t necessarily news to another – it all depends where you are, and where that news is coming from. The form spread around the world, often as off-shoots of the French parent companies of Pathé and Gaumont. Filmed news became a product of the early film multinationals, and through means of international exchange, world news was screened in cinemas across the globe, though the time taken to transport film internationally lessened its value as news, and audiences expressed a strong preference for local news, on subjects that were news to them. ‘Foreign’ news often wasn’t news at all, in its timing or in how the audience viewed it. The newsreels were released at regular intervals to match the pattern of cinema-going that people in their millions were starting to adopt. In Britain newsreels were very early on issued twice-weekly and stayed that way for five decades. In the US the distances were greater and so news tended to be issued weekly. Newsreels had become firmly established as part of practically cinema programme by the start of the First World War, and newsreels were to play a key part in informing audiences about how the war was progressing. Such was their importance that the British, French and American governments each took over or created a newsreel to act as a means to deliver officially sanctioned footage (i.e. propaganda) – respectively War Office Offical Topical Budget, Annales de la Guerre and Official War Review. In the 1920s newsreels built on these strong foundations and became an essential and popular element of the cinema programme. The average newsreel in the silent era ran for some 7-8 minutes and contained anywhere between four and eight stories, eached introdued by a title card with the story title and a short comment, and sometimes with further titles cut into the story as the newsreels increasingly sought to add commentary even before sound gave them their voice. The newsreels rapidly gained a repuation for light-hearted items, stunts and gimmicks, with a fascination for sport, royalty, pageantry, tradition and sensation. Oscar Levant notoriously summed up newsreels as being “a series of catastrophes ended by a fashion show”. That’s unfair. Anyone who has looked at newsreels in any sort of depth will soon find that there was a lot more too them than fashion shows. 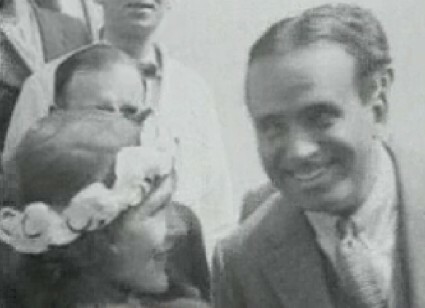 The newsreels were acutely aware of what were the current topics of conversation (they were released after the daily newspapers, so the news agenda had been already set for them) and picked up on the personalities and issues of the day that audiences wanted to see covered with an astute eye. This propensity for the topical makes them an excellent barometer of contemporary social concerns, albeit usually sugared with that lightness of tone that the newsreels deemend necessary because they were, after all, in the entertainment business, and their audience had come to the cinema to be entertained. The newsreels entertained, and that ultimately became the noose around their necks that condemned them. That however was in the future – our concern is with the silent era, and in the 1910s and 1920s the newsreels reigned supreme, and we cannot understand what silent cinema means if we do not take them into consideration. Indeed no other area of silent cinema is so well represented online as newsreels (such is their continuing commercial value). These services has been covered by the Bioscope before now (see links below). As it is Pathé’s centenary, let’s finish with a few words about them. First of all, happy centenary! the Bioscope sends its congratulations on having achieved such a major milestone and still a significant commercial moving image presence. Pathé has changed hands several times down the years. Until a couple of years ago it was owned by the Daily Mail newspaper; now it is managed by venture capitalists. For anyone who cares about newsreels, the British Pathé site is a mixed blessing. It is a wonderful window onto the past, the digitisation of the films having been originally funded by the Heritage Lottery Fund but kept on as a free service long beyond the original agreement with the HLF. But on the other side it has of late become a little soulless, disfigured by front page advertising, and dominated by an idea of news as gimmick and sensation, a lucky dip into the quaint ways in which our ancestors behaved rather than showing what the newsreel fundamentally was – a vehicle for the news. One cannot get a sense of the Pathé newreels as newsreels i.e. as a set of stories released on a single reel, and for that it is necessary to cross-refer to the BUFVC’s News on Screen site (formerly the British Universities Newsreel Database) where you will find an almost complete record of issues for all British newsreels 1910-1979, together with background histories, biographies of those who worked in the newsreels, digitised documents, and links across to the British Pathé site. It is place to go if you appreciate newsreels for what they mean to the study of society and history. Newsreels matter – and the more we understand them the more we will get from viewing them. Pathé editor P.D. Hugon wrote an informative booklet Hints to Newsfilm Cameraman (1915) with much information on how newsreels operated at that time. The online text has an important introduction by Nicholas Hiley. British Pathé has a lively Twitter feed, drawing attention to exciting novelties they discover in their collection. I’ve written lots about newsreels in the past. My history of the Topical Budget newsreel (1992) is long out of print (but you can get it dirt cheap second-hand), but there’s Yesterday News: The British Cinema Newsreel Reader (2002) which tells the history of British newsreels through texts contemporary and modern, and most recently I’ve an essay on newsreels in Richard Howells and Robert W. Matson’s Using Visual Evidence (2009).